A blepharoplasty, more commonly known as an eyelid lift, reduces the puffiness and baggy look of the eyes by removing the excess skin, tissue and fat. Through many reasons, ranging from genetics to aging, the appearance of the eyes may look saggy (from lost of elasticity), tired or puffy. Through a surgery, extra skin and fat are removed or repositioned on the eyelids – both upper and lower – to create more refreshed, alert eyes. The surgery works to modify the eyelid by removing excess skin and fat, while surrounding muscles and tendons may be strengthened. It is not uncommon for additional procedures to be performed alongside blepharoplasty to create the desired appearance of the eyes. 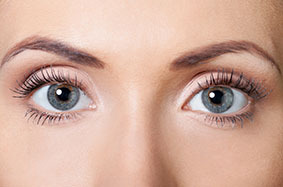 In cases where the eyebrow is sagging as well, a brow lift may be recommended. Crow’s feet (or laugh lines) can be smoothed with Botox, and other treatments can help with dark circles, such as Restylane, Beautical, or even a fat transfer.